Production has increased by several thousand units per month as a result of eliminating failures in high temperature grease lubricated cam followers. A change to GRAPHALLOY, a graphite/metal alloy bearing material, has helped TI Automotive increase production in a heat shrink furnace that is critical to their operation. Before the change to GRAPHALLOY cam followers, the conveyor bearings failed about once a month because the heat of the furnace evaporated their high temperature grease lubricant. It took about half a day to cool down the furnace, change the bearings and reheat the furnace so that production could be restarted. "The new bearings have already lasted for about five years without a single failure," said Harry Foley, Process Improvement Engineer for TI Automotive based in Ashley, Indiana. "They have eliminated the downtime that formerly plagued this operation. Since we installed them I estimate we’ve saved well over 300 hours of production downtime that would have been lost if we had kept the old bearings." The double-walled Bundyweld tube produced by TI Automotive has become the automotive industry standard for brake and fuel lines and the company has also pioneered quick connectors, anti-abrasion sleeves, corrosion coatings and bundling. A continuous strip of copper plated steel is wrapped and bonded to form a double-walled tube designed to carry fluids at high pressure, as well as to provide greater assurance against leakage in low-pressure applications. The latest manufacturing techniques have allowed for precise control of the temperature and brazing conditions and can be coupled to other continuous processes, such as coating. Coatings enhance the proven integrity of Bundyweld tubing, giving protection against corrosion and abrasion in extreme environmental conditions. All underbody components, including the brake line, have the potential to be struck by objects thrown up by the tires. TI Automotive provides extra protection against damage by specifying the addition of a plastic sleeve to the tube areas most vulnerable to stone damage. Sleeves can be applied to either add further abrasion resistance in areas of high potential impact or to give noise/vibration/harshness reduction benefits. When heated, the sleeve shrinks to conform to the size and shape of the underlying material. The company uses a special furnace to increase the productivity of the heating operation. The oven is open on both sides and has a conveyor system that runs through the furnace and extends a distance on either side. This highly efficient production heating process is capable of producing between 3000 and 5000 parts per day depending on customer order levels. 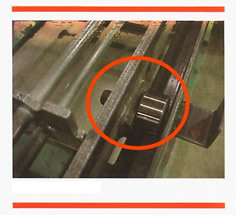 In the past, the conveyor rode on ten standard cam roll bearings that were lubricated with high temperature grease. The problem was that the heat caused the grease to deteriorate and led to early bearing failure, typically after about one month of use. The bearing replacement process typically took about four hours, which resulted in a production loss of between 1500 and 2500 pieces. In an effort to solve the problem, Foley tried many different lubricants but was never able to find one that would last any longer than a month. He also tried stainless steel bearings without any lubricant but found that they were also unable to stand up to the application. Then Foley searched an industrial directory for high temperature bearings and found GRAPHALLOY, a high temperature graphite-metal alloy bearing material. GRAPHALLOY combines the properties of graphite and metal. The graphite structure can be compared to a deck of cards with individual layers that are able to easily slide off the deck. This phenomenon gives the material a self-lubricating ability that is matched by no other material. External lubricants are simply not necessary. GRAPHALLOY is graphite filled with a metal impregnant to enhance the chemical, mechanical and tribological properties of the material. Foley called up the bearing manufacturer and soon received an application data sheet asking for information such as the inside and outside diameter of the bearing, temperature of the application, operating speeds and loads, etc. He filled out the form and faxed it back to Graphite Metallizing. The company responded with a proposal that included drawings, operating specifications and procedures. The bearing manufacturer said that they had no doubt that their bearings would easily stand up to the application. Foley purchased 10 of the bearings and installed them in the conveyors. "The performance of the new bearings has been simply amazing," Foley said. "We have gone from a situation where we had to change bearings every month to one where the bearings never need changing. They have already been in operation for more than five years and not a single one has failed nor have we seen any signs of problems. The result is that we have been able to significantly reduce production downtime. During the periods when our operators used to have to sit on their hands waiting for bearings to be changed, they are now pumping out parts." GRAPHALLOY bearings are self-lubricating because when the bearing is rubbed against metal or ceramics, a microscopically thin graphite film is quickly laid down on the shaft. This low-friction film plays a vital role in controlling temperature rise during operation. The formation of a proper transfer film requires the presence of absorbable vapors such as water. Grades with special impregnants are available for those rare applications in which no suitable vapors are present. This unique self-lubricating bushing material requires no grease or oil, survives run-dry conditions, and eliminates galling and seizing in hot and dry conditions. GRAPHALLOY is ideally suited to applications where temperatures are too high to permit the use of oil or other lubricants because there are no lubricants to congeal or solidify. GRAPHALLOY will not soften at high temperatures or extrude under load. Many grades are suitable for temperatures to 750o F in air, where oil-based lubricants burn off or oxidize and plastics fail. Special grades give good service up to 1000o F and higher in non-oxidizing atmospheres. The material provides other properties that are beneficial in this and other applications. It maintains its integrity even when submerged in hostile liquids such as acids, alkalies, hydrocarbons, black liquor, and liquid gases. The material provides a constant, low coefficient of friction rather than just a surface layer, helping to protect against catastrophic failure. Lubrication is maintained even during linear motion; lubricant is not drawn out and dust is not pulled in. GRAPHALLOY wear components also improve reliability under conditions such as low speed operation, frequent starts and stops and switch-overs from standby to continuous running. GRAPHALLOY bushings are available in over 100 grades of material in any desired size or geometry, including cylindrical with or without grooves, flange or double flange, split and metal-backed. Grades and design are engineered to best serve the application.